Free Webinars – Compliance – Health & Safety, Environment, Energy etc. Home / News, Views & Updates / Free Webinars – Compliance – Health & Safety, Environment, Energy etc. We are delighted to bring you two free webinars from Antaris Consulting. 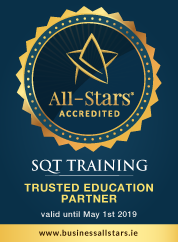 Antaris provide SQT’s Quality, Health & Safety, Environment & Energy Training courses. 1. Can the threat of adverse publicity motivate companies to achieve legal compliance? This webinar explores the question ‘Have adverse publicity orders lead to more effective regulatory compliance?’ You will have the opportunity to learn about current trends in multi-jurisdictional compliance and hear from one of our senior consultants, Cheryl Robertson. Cheryl has previously worked in the oil and gas industry in Environment and Health & Safety. Cheryl is a senior consultant with Antaris, with over ten years’ experience in the field of consulting, specialising in Environmental Management and Integrated Management Systems with Environment, Health & Safety and Quality. This webinar looks at how multi-national companies can overcome the challenges of delivering multi-jurisdictional compliance. This webinar is delivered by Gerard Higgins, the CEO of Antaris Consulting and has over 20 years’ experience in Environment, Health and Safety.